The latest slot machine to be released at Wagerworks casinos this summer is the Transformers video slot. The Transfromers – Ultimate Payback five reel 25 pay line slot is themed around the retro cartoon, and more recently blockbuster movie. As with all new slot game releases at Wagerworks casinos, Transformers contains fantastic animation, sounds and bonus round. The transformers bonus round is very similar to the bonus rounds you’d find on online fruit machines or pub fruit machines. The bonus round is activated by matching the bonus symbol on reels one and five. The first part of the Transformers bonus round is a free spins symbol, where players can earn up to 100 free spins. True Transformers fans will probably prefer the second bonus on the Transformers slot which involves Optimus Primus fighting Megatron. Players must pick the winner of the battle to earn a cash bonus. The Transformers Ultimate Payback slot machine features the Transformers characters packed onto the reels, so expect to see the likes of Optimus Prime, Bumblebee and Megatron whilst playing Transformers online. The Optimus Prime symbol acts as a wild which can be substituted fro another other symbol to help players make a winning line. Other features on the Transformers slot include Cybertron, that acts a win multiplier between x2 and x10. Transformers online slot is definitely one of our favourite slot games to be released in 2009. The bonus rounds are good fun and will appeal to fans of fruit machines, and the sounds and animation during the game will make massive appeal to all Transformers fans. When it comes to playing the Transformers slot online we recommend playing at either Virgin casino or Kerching. 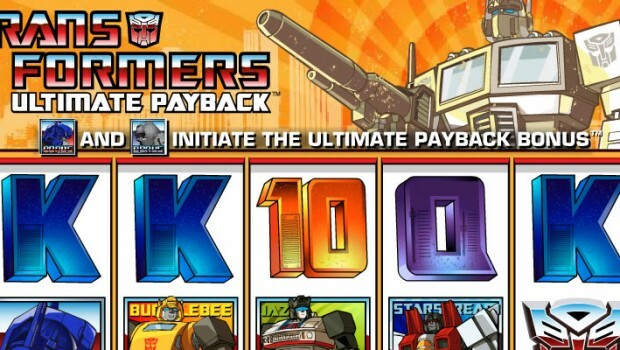 Both offer generous new player bonuses to give the Transformers slot a try. Kerching Featuring the popular Transformers Slot and many more fruit machine slots. Virgin Games Virgin Online Casino has lots of slots and fruit machines including Transformers Slot.